Figure 1 shows a experimental setup that I like to use as teaching aid in my control courses. 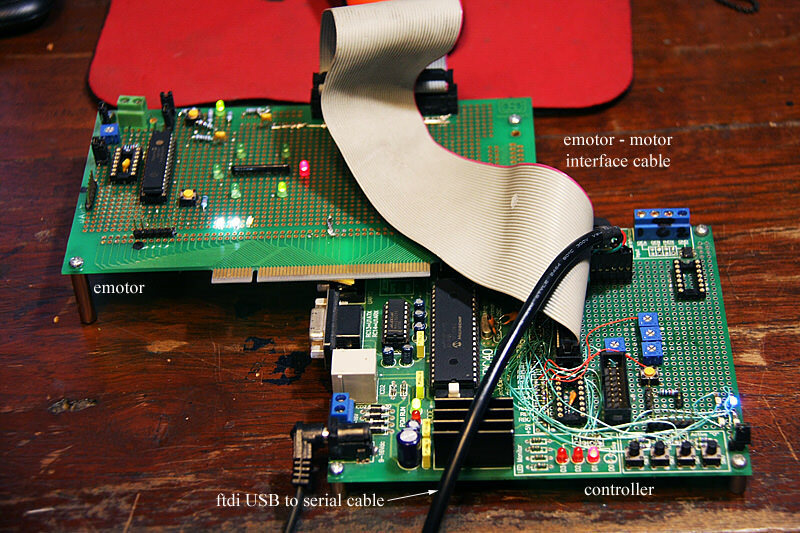 It consists of a DC motor simulation board (called e-motor) and a control board connected together via ribbon cable. The e-motor and some part of the controller are soldered and wired on prototype areas. Even though this HIL setup is much lighter than a real DC motor, I still hate to carry the boards from my office to the classroom on another building. After a couple of weeks on serious board and PCB design with the aid of Eagle software from CadSoft, I come up with a new setup shown in Figure 2 for my class this semester, with all the improvements listed above. 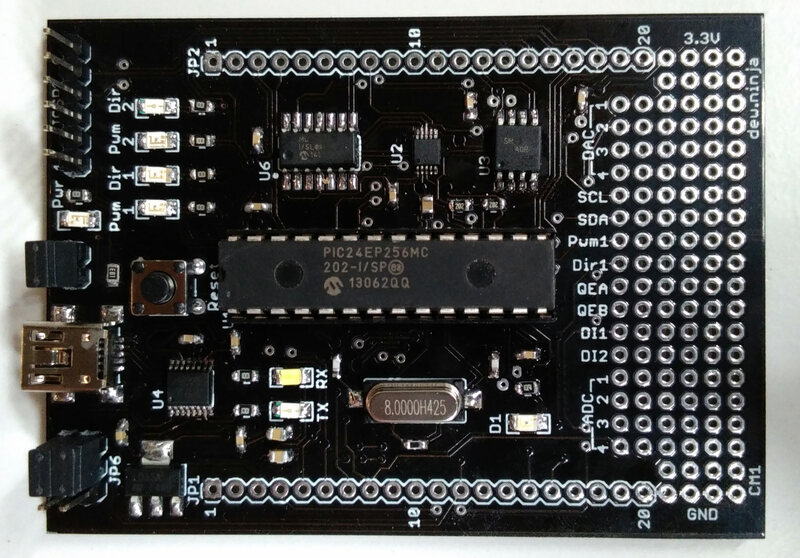 Board dimensions are small enough that the designs could be carried out using freeware version of Eagle. The prototypes are labeled CM1 and EM1 for the control and e-motor modules, respectively. The Controller Module (CM1), shown in Figure 3, serves as a target board for controller implementation. The user can select standard PID structure and adjust the parameters, or using PID autotuning feature, or even design a custom controller using plant data from system identification process. To accommodate user communication, the CM1 executes a simplified real-time operating system called RED (Responsive Embedded Development), that utilizes a variant of cyclic executive scheduling. Other features: external UART communication and power supply selectable by jumpers. Prototype area. DC-motor simulation is implemented on the E-motor Module (EM1) in Figure 4, which can be coupled to the CM1 board via connectors along the board edges. 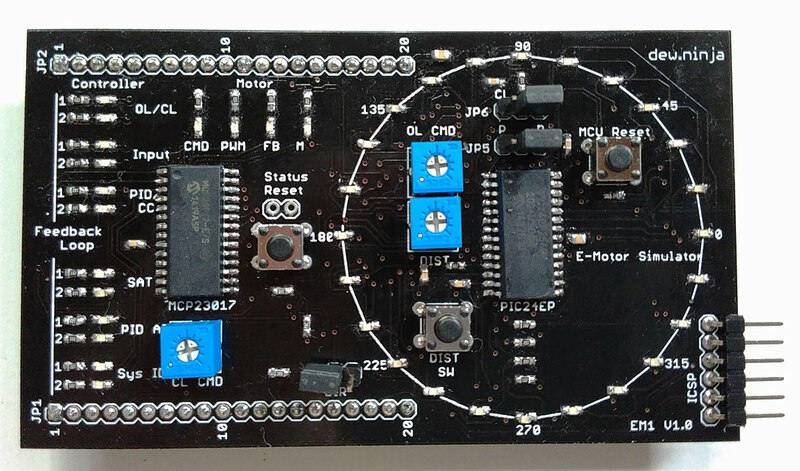 In addition to the motor simulation part implemented on PIC24EP256EP202, this board also provides various status LEDs such as feedback loop open/closed, PID autotuning active, etc. using MCP23017 16-bit I/O expander. Output disturbance can be applied by pressing a push-button switch, just like the user presses on a motor shaft disc to drag the rotation. The software parts for these prototypes are still under development as they are planned for teaching aids this semester. Basic controller functions, and even some advanced implementation such as H∞ control, were tested earlier with satisfactory results. In order to be used by a beginner with little knowledge in control engineering, the software must be improved for more user-friendliness. Progress will be posted later on dew.ninja. Posted on March 19, 2018 by dewdotninjaPosted in Archive, embedded systems, hardwareTagged embedded control, motor simulator.